Illawarra started 1992 with their first title of any sort - taking out the Toohey’s Challenge Cup in the pre-season by beating Brisbane 4-2 and then backed it up with a sensational 1992 Winfield Cup campaign. They were remarkably consistent - losing two games in succession only once (Round 12-13 to Norths and Penrith) but from Round 6 through Round 16 - won 8 of their 11 starts to set themselves up in 3rd spot on the ladder entering September. The core of that 1992 team was Russell, McGregor, Wishart, McIndoe, Rodwell, Simon, Piccinelli, Dean Schifilliti, John Cross, Dale Fritz, Bill Dunn, Craig Izzard, David Walsh, Steve Waddell, a 20 year old called Ryan Girdler and a seasoned half called Mick Neil. The Steelers made it all the way up to 2nd after Round 16's 8-6 win over Newcastle but slipped to 3rd by the time the Finals rolled around - having split their final four games against the Raiders, Panthers, Manly and Brisbane (of which Brisbane were not a playoff team from 1991 but the Broncos were already Minor Premiers by their Round 22 clash). Entering September with the best defence in the competition, Illawarra first defeated St George in the Major Preliminary Semi Final 18-16, before losing back to back games in the Finals - to Brisbane 22-12 in the Major Semi Final and then the Preliminary Final to St George in an agonising 4-0 contest where the Steelers had multiple tries disallowed because of forward passes. Those missed chances would turn out to be the last chance Illawarra (as a stand-alone club) had during their only genuine premiership window. That year some very good teams failed to make the Finals (Canberra who had made three straight Grand Finals, North Sydney who were 3rd the year before, Manly who finished 2nd on the ladder in 1991 and Canterbury - who would go onto be back to back Minor Premiers in 1993 and 1994) - which meant the Steelers had been given a huge opportunity to break through for their maiden premiership. Season 1993 opened with optimism that this could be Illawarra's year, especially having signed international backrower Bob Lidner from Western Suburbs. They opened the season with wins in 4 of their first 5 games before crashing to 4 straight defeats and they looked destined to chase their tails for the rest of the season. They won just twice from Round 6 through Round 13 but the Steelers rallied with 4 straight wins over Balmain, Penrith, South Sydney and the Gold Coast to get within 3 points of the 5th placed Bears with 5 games left. However back to back losses on the road to Manly and Easts ended their 1993 campaign, as Canterbury, St.George, Canberra, Manly and Brisbane separated themselves from the pack in the final month (amazingly just two points separated Canterbury in 1st from Brisbane in 5th). The Steelers did get some satisfaction late in the season - beating North Sydney 28-8 at North Sydney Oval in Round 21 to end the Bears' playoff hopes. Illawarra finished with a 12-10 record for 24 points in 7th spot, but a full 8 points out of 5th. Entering 1994 Murray had his team refocused on a challenge (despite losing Lindner, Schifilliti and Dale Fritz; Illawarra signed Darren Fritz from Canberra, Peter Johnston from South Sydney and veterans Andrew Farrar and Joe Thomas from Wests) and had a more mature John Simon calling the shots at #7. Simon was a gifted player with that turn of brilliance which made defences scared that ‘today he might be on’ before every game. Coupled with a smart and settled footy team around him, Simon was the difference maker for the Steelers in 1994. They would win 11 of 22 games (drawing a remarkable 3 times) in 1994, finishing just 2 points out of the Final 5 on 25 points. They went 8-2-2 at home yet still missed out on playing September football because they couldn't find a way to win consistently on the road going 3-6-1. In almost every sense - Illawarra was the 6th best team in 1994. They were the 6th best attacking team after the Final 5 sides, and the 6th best defensive team (again after the Final 5 sides). Only Cronulla had more wins than them in 7th with 12 but Illawarra only lost 8 games to Cronulla's 10. After a bad start to the season – where they won just one of their first 7 games (1-4-2), Murray’s men went on a run over the next 9 games that saw them win 7 games and draw another, picking up 15 competition points and put themselves into 5th position at the end of Round 16 when they crushed Western Suburbs 40-18. At that stage the Top 4 looked settled with Canterbury on 26pts, North Sydney on 25pts, Manly on 23pts and Canberra on 22pts - all clear of the 5th placed Steelers on 19pts, tied with South Sydney. The chasing pack was Newcastle and Cronulla on 18pts, defending premiers Brisbane on 17pts and Penrith on 16pts. But despite sitting in 5th, Illawarra's run home was incredibly tough – facing Manly, Cronulla, South Sydney, Canberra, Canterbury and Newcastle in the final six rounds. They controlled their own destiny at the time but every team they would play was in the playoff race with them and with Brisbane making a late season run it was down to the pair for the final spot. Brisbane would win 4 of their last 5 to jump from 9th at the end of Round 16 to 5th with 27 points, leaving the Steelers - who went 3-3 only 25 points- on the outside looking in. Illawarra would lose to Manly 14-29, crush Cronulla 42-18, edge South Sydney 30-28, but then ran into the brick walls of premiership heavyweights in Canberra 8-19 and Canterbury 16-26 to be out of the running entering Round 22 against the Knights. Though the Steelers won the battle of the Steel Cities 20-14 on the Friday night, Brisbane would crush Balmain 41-6 in front of 47,486 fans at Brisbane's ANZ Stadium to finish Illawarra's season off. It was a gallant effort to get so close to a Final 5 berth after starting with just 4 points in the first 7 rounds and proved to be the last march of the Steelers in a unified competition. Steelers Stadium attracted an average of 11,911 across 11 games that season, with a season high of 15,668 against the Raiders in Round 20 with their playoff hopes on the line. The highlights of the season were wins over St George 24-0 and Brisbane 26-4 both at Steelers Stadium, but in the end their failure to beat four of the five playoff teams from 1994 in Manly (drew 18-all in Round 2 and lost 14-29 in Round 17), Canberra (lost 16-30 in Round 5, 8-19 in Round 20), Norths (lost 4-12 in Round 12) and minor premiers Canterbury (lost 16-26 in Round 6 and by the same score in Round 21 - the loss that saw Brisbane pull clear) – sealed their playoff fate. Injuries had played their part in halting the team's final charge. Russell had been a key player at the back of the scrum during the last few seasons but he only played in 9 games that year and fellow veteran Steve Waddell only appeared in 4 games. Rodwell scored 12 tries to lead the team, and the club had found a handy winger in Nigel Roy who scored 10 tries but he would sign with the North Sydney bears along with another promising outside back in Jody Rudd for the 1995 season. Russell was also lost to the expansion North Queensland Cowboys, while veteran pair Thomas and Farrar retired after a final season with the Steelers. By 1995 Murray's Steelers were caught in the cross-hairs of the ARL v Super League opening salvos and Murray lost his job for aligning with the rebels early in the season. 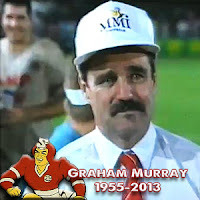 His Steelers won 2 of 4 to open the 1995 ARL season - beating the newly formed Auckland Warriors 40-28 in Murray's second last game in charge at home and he finished with a victory in his last game as Illawarra head coach - on the road - with a 20-16 win at the SFS over South Sydney. 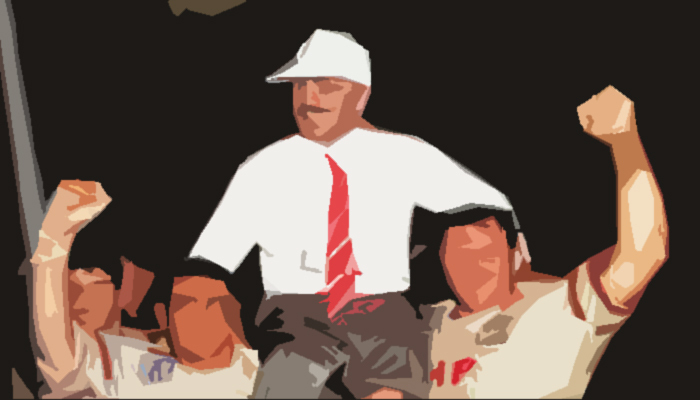 Illawarra finished the season with Allan Fitzgibbon in charge and a 10-11-1 record to place 12th. He would finish his time as an Illawarra Steeler with a 51-39-5 record in 95 games - a winning percentage of 53.7%. Murray's run at Wollongong Showground/Steelers Stadium including a remarkable stretch of 14 wins in a row at home after a loss in his first game in charge there in 1991 and his total record of 33-11-2 in 46 games at home netted a winning percentage of 71.7%. He also coached the club to its only title - the 1992 Toohey's Challenge Cup. He spent 1996 out of NRL – before returning with the Hunter Mariners for the 1997 Super League season and leading them to the World Club Challenge Final against Brisbane. After two years in charge of Leeds in the UK including a Grand Final appearance in 1998, he was then set to take over at North Sydney in 2000 after Peter Louis was sacked during the 1999 season but that fell over when the Bears merged with Manly to form the Northern Eagles in 2000. But his missed opportunity with the Bears opened the door for a return to the NRL in 2000, taking over from Phil Gould at the Roosters and guiding a talented team to the Grand Final against Brisbane that very season with Brad Fittler as the central figure in their run. But a first round elimination in the 2001 playoffs saw Murray lose his job to the incoming Ricky Stuart and he ended up in Townsville in the early stages of the 2002 season - replacing Murray Hurst in charge of the North Queensland Cowboys (who had replaced Tim Sheens in mid-2001). 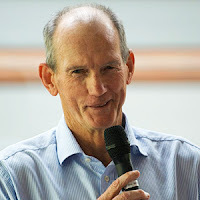 Murray was able to build on what Sheens had tried to build in North Queensland, making the Cowboys competitive in 2003 where they reached double figure wins for the first time in club history, before making the Preliminary Final against the Roosters in 2004. His last Grand Final as a head coach came in 2005 when the Cowboys faced off against the Wests Tigers in Johnathan Thurston’s first year at the club. They would make one last push under Murray in 2007 - losing to Manly in the Preliminary Final after a late season surge of 7 straight wins got them to within a game of another Grand Final. Murray lost his job during 2008, with Ian Millward taking over (who was then replaced by the now-sacked Neil Henry), and didn't coach in the NRL again thereafter. He was appointed as a coaching director of sorts at the Newcastle Knights in early 2012 but then his health problems began and he stepped aside by the end of the season. He was planning to take up a head coaching role with the QLD Cup’s Wynnum-Manly Seagulls but another setback in his health saw him step aside before the season began. He passes at age 58 and was a coach that I always wanted my club to look at signing when he became available because of the way he handled himself personally (he was widely regarded as man who 'got on with everyone') and I was always impressed with the game plans he asked his teams to play. To me it always seemed like he would let his creative players play footy - which is right up my alley of how I want my team coached. That is why we may have seen the best of Ian Russell, John Simon and perhaps Bryan Fletcher under the tutelage of Graham Murray, and as an added bonus from Murray we all saw the transition from diamond-in-the-rough to superstar of the game in one Johnathan Thurston. My endearing memory of Murray is him sitting in in the players' terrace close to the tunnel during a game - yacking into a walkie talkie... with a glorious moustache on show for all to see. My thoughts and prayers are with the Murray family. “Graham and I go back as far as 1992, when he was coaching Illawarra and the Broncos played them in a semi-final. I coached against Graham over the years, in 1997 when he was coaching the Hunter Mariners in the World Club Championship and then for the Roosters in the 2000 Grand Final, those games stand out to me. “We had a long association but I didn't get to know him like I did when he came down from Brisbane to head up our High Performance Unit. “After being an NRL coach for a such a long time it was a game-changer for him but he could see the benefits of what he was doing, which he often spoke to me about. “I was proud of his achievements with the High Performance program and he showed again why he was such a good coach. He was interested in everyone and got heavily involved. “He was enjoying coaching the fundamentals of the game and seeing the impact he could have on the kids coming through as well as on the coaches. “He had a lot of passion for the game and we enjoyed having him at the Club, and the quiet way he went about things. “We were sorry when he left the Knights because we lost a guy that was making an invaluable contribution to the Club. Now we have all lost a guy who made an invaluable contribution to the game.